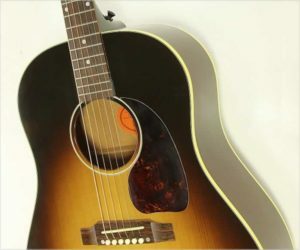 Based on the Songwriter designed by Ren Ferguson at the Gibson Acoustic shop in Bozeman, Montana, the Gibson Custom Shop Songwriter Performer Limited was produced during 2012. 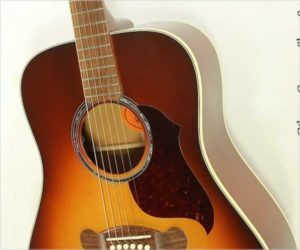 Using a traditional square shoulder Dreadnought body of Sitka Spruce and Mahogany, and a 25.5 inch, long scale Mahogany neck and Indian Rosewood for the unadorned fingerboard and bridge, the Gibson Custom Shop Songwriter Performer Limited sports an abalone ring around the soundhole. 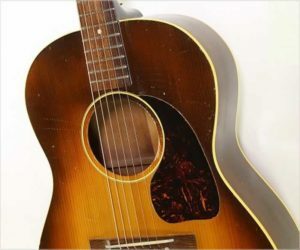 This Gibson LG-2 produced just after World War Two ended. 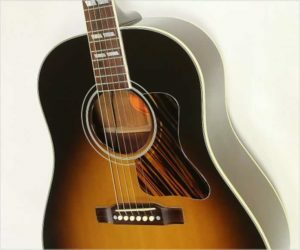 Because there’s no serial number or any production numbers, we’re dating it by features. 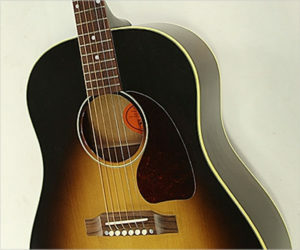 The LG-2 was introduced in 1942, with a Firestripe pickguard (changed to faux tortoise in 1943) and a Banner logo – the famous “Only a Gibson is Good Enough” banner. This banner was discontinued shortly after at the end of the war, in 1946, but the Script ‘Gibson’ logo was maintained until 1948. So, this example dates to 1946 or possibly 1947.